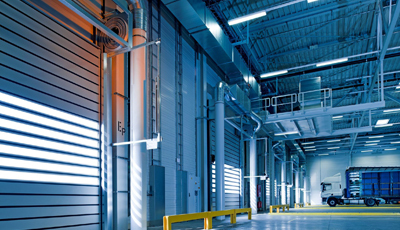 Commercial and Industrial Mist Systems are ideal for shopping centres, waste plants, atriums, car parks, warehouses, factories, pallet racking units, commercial kitchens, pubs and restaurants. With this type of property there are different configurations to consider in terms of ceiling height and fire fighting requirements that have to be addressed in the design of our mist systems. Health and safety regulations in these types of properties normally dictate that there is a fire suppression system installed. Our Industrial Mist systems ensure that if a fire were to happen it would be arrested as fast as is possible and that the minimum of loss occurs to expensive property. Through specially designed nozzles, mist sprinkler systems distribute smaller droplets at a higher velocity with a large range of droplet sizes fight a fire in many different ways at the same time. The largest droplets penetrate the fire plume and smother the fuel surface stopping flammable gases being created. The medium sized droplets penetrate the plume and evaporate inside the fire creating inert gases. The smaller sized droplets evaporate around the fire cooling the area preventing the fire from spreading. Water steam created inside and outside the fire use up the fire energy and will also help coat the fire fuel surface. This mist technology enables four fire-fighting methods at the same time which will optimise the water usage thus creating a highly efficient, effective system. I am interested, what should I do next? Feel free to browse the technical information in our factsheets. If you’d like to talk to us about your specific requirements, why not get in touch? Fire in commercial and industrial properties can spread quickly as sometimes the property for example, a warehouse, can be un-manned for periods of time. Installing our state of the art mist system ensures that you have the best fire fighting tools at your disposal 24 hours a day. It will sense any fire at its earliest stages and start the process of extinguishing it quickly and efficiently.